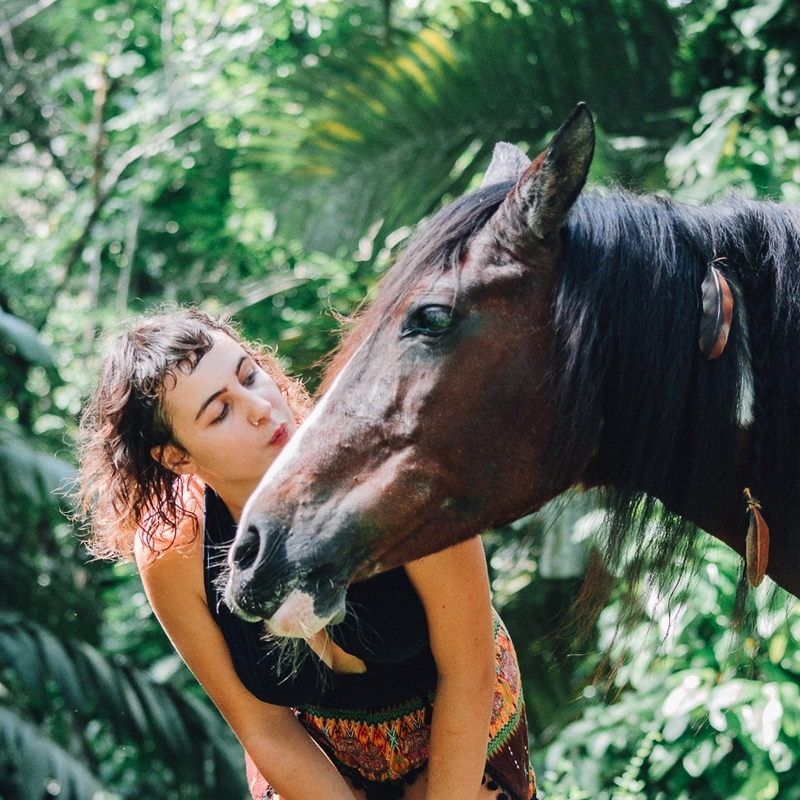 Had it not been for my daughter who decided to volunteer at an equine yoga retreat center, I would probably never have thought of going to join her to stay for 10 days in Costa Rica. Let me tell you…I would have missed an EXTRAORDINARY experience!! First of all, the welcome of Terry, the wonderful creator of Kindred Spirits, who takes us to another human dimension, is simply unique! She makes us feel at home from the first moments, as much by her warm personality as by the love she puts in everything she does: yoga classes, sharing her passion for the environment in which she lives, the opening of her home where we take all the delicious meals of midday and evening (concocted by talented cook volunteers - my daughter for the occasion 😉). And what about the little house where we are housed. Pretty as all, provided with all the conveniences and in the heart of the jungle where one has the chance to hear and see monkeys, multicolored birds and all this splendid nature. Finally, to top it off, she makes us discover a little known world: yoga with horses. I never thought that such a connection was possible between an animal and a human ... and in such a short time. The emotions that I experienced at this moment are impossible to describe in words ... it is definitely necessary to live it! Besides, I would advise all moms and their daughter who want to share something really different and harmonious in a beautiful place, to “fly to” Kindred Spirits! They will leave with a light heart filled with peace and love. What a healing! Thank you Terry, to your daughter Lexie and to your beautiful team of volunteers! I will always remember you all! 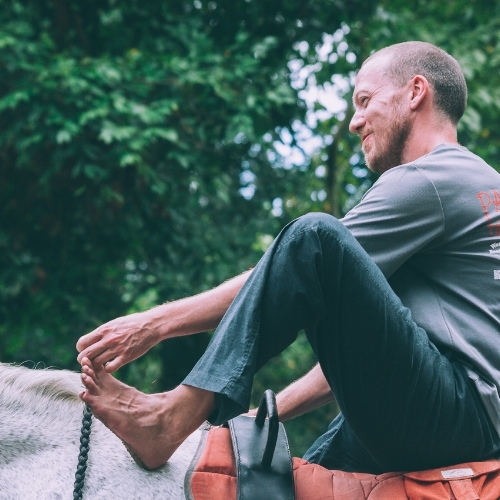 I spent one week at Kindred Spirits for a Harmonious Equine Yoga Retreat and it was just amazing! I really enjoyed all the activities, yoga practices, connecting with horses, super tasty food and all of this in a lovely group of people. Everyone was so welcoming, warm and genuine and it really felt like a home away from home. I told them before I arrived that I was allergic to gluten and all the meals were prepared gluten-free and just delicious. The location is unique and beautiful in the middle of the jungle, yet very close to the beach for surfing and beach treks. Riding at the beach and swimming with the horses was definitely a highlight of the retreat and an experience of freedom and joy that I will never forget. I had the most amazing time with Terry, her family and her staff and I truly recommend attending the retreat and hope to return soon again. "Replenishment for body and soul"
We came to Kindred Spirits at the start of our Costa Rican adventure, and we couldn't have asked for a better experience. Terry, her family, and volunteers were so warm and welcoming, we immediately felt at home. The accommodations were beautiful, a little house in the jungle. We fell asleep to the singing of frogs and insects and woke to the calls of parrots and monkeys. Each day was the perfect mix of yoga, mediation, rest, horses, and Maryam's amazing cooking. The yoga chalet in the jungle is so beautiful, and riding down to the beach was a blast (although quite challenging due to high water and downed trees from a recent storm). We feel so grateful and full of light from our time there. Our minds and bodies are awakened and ready for the next adventure! Everyday that I woke up I felt like I was in a dream. The definition of a kindred spirit is “an individual whom we share a spiritual connection with.” When I arrived at Kindred Spirits I feel an instant spiritual connection with everyone and everything there. Everyday that I woke up I felt like I was in a dream. I loved everything about my travel and yoga experience. My whole experience was a healing and life changing. Terry and her daughters instantly welcomed me with a warm and sweet Costa Rican welcome. Terry’s love for the caribbean and her love for animals makes KS feel like a family. I felt like this space was my home away from home. I connected with everyone involved within the Kindred Spirits community. The volunteers Issy & Maryam are two very talented women who showed their love and passion through their work. Maryam’s cooking was spectacular and everything she cooked with made with love, flavor, creativity, and purpose. Issy’s talent and connection with horses showed through her knowledge and with her calm and caring energy. I feel even more blessed to have my yoga journey lead by my instructor Corinne. Corinne is such a kind, patience, and strong woman she taught me so much about yoga and about myself too. My yoga practice everyday changed the relationship I have with my mind, body, soul and heart in such a positive and impactful way. I was surrounded by women who were open and supportive in every way. Kindred Spirits is a place that I will always have in my heart. It is a place where I was about to live in every moment and be gifted with love, laughter, and memories that I will never forget. Thank you Terry (for sharing your space with me) & Thank You Corinne for guiding me through this experience. This training went beyond a training to an inspiring life experience to remember forever. I loved Corinne’s relax, warm & integer personality, she has a lot of personal experience concerning yoga therapy and it was very interesting to be teached by her with so much knowledge & wisdom concerning yoga and horses. She is so steady and warm hearted that I immediately felt at ease with her. I also appreciated the games we played with the horses! I loved it! I was impressed by Terry’s ease how she manages all her horses and the teachings with the horses. She shared all her knowledge with a warm, loyal & open spirit, at ease & energetic, with patience and wisdom and as a coach. It was not only learning about yoga & horses but also learning about myself. Corinne & Terry together, make that, each by their personal and at the same time common approach, this training went beyond a training to an inspiring life experience to remember forever. They both have a special place in my heart as well as their wise horses! I must also mention the food which was super delicious every time, so my stay there was also a culinary stay in an remarkable fantastic environment! To conclude I can only say that I can recommend you their teachings. I absolutely loved my little jungle cottage. My name is Aude Castan, I'm a french female of 30 yo. I stayed with Terry for about three months, from February till May 2018. I absolutely loved my stay at Kindred Spirits. Terry and her family are very welcoming, the facilities including the volunteer's house are fabulous. I absolutely loved my little jungle cottage, and the vegetarian food cooked either by Terry or the chefs volunteers. The horses are amazing, each of them have a very strong and beautiful personality. The tasks take only 4-5 hours per day, even less if there is two experienced volunteers, and are not very complicated for someone who already know about horsemanship. However they require quite a bit of autonomy as Terry is often busy with her daily chores and administrative tasks. She taught me a lot about natural horsemanship, natural healing, yoga of course, as well as meditation with horses and breathing techniques applied with horses. Note that this learning sessions are provided mostly on your free time. As I was very keen to learn, and an experienced rider I had the opportunity to spend countless hours training with the horses, riding to the beach etc. I would definitely recommend this place to anyone responsible, who is used to work in autonomy and is interested in natural horsemanship more than into hacking or classical riding. (This is not a trekking company nor a riding school !) Also, the farm is in the middle of the jungle, which mean your neighbours will be spiders, scorpions, monkeys and sloths, and that the closest city (with some great restaurants and bars) is a good 1h walk through the hills (there is some bikes if you are sporty and taxis of course). When I found out about this course I knew I had to unite two of my passions together, yoga and horses and find other souls that felt the same. 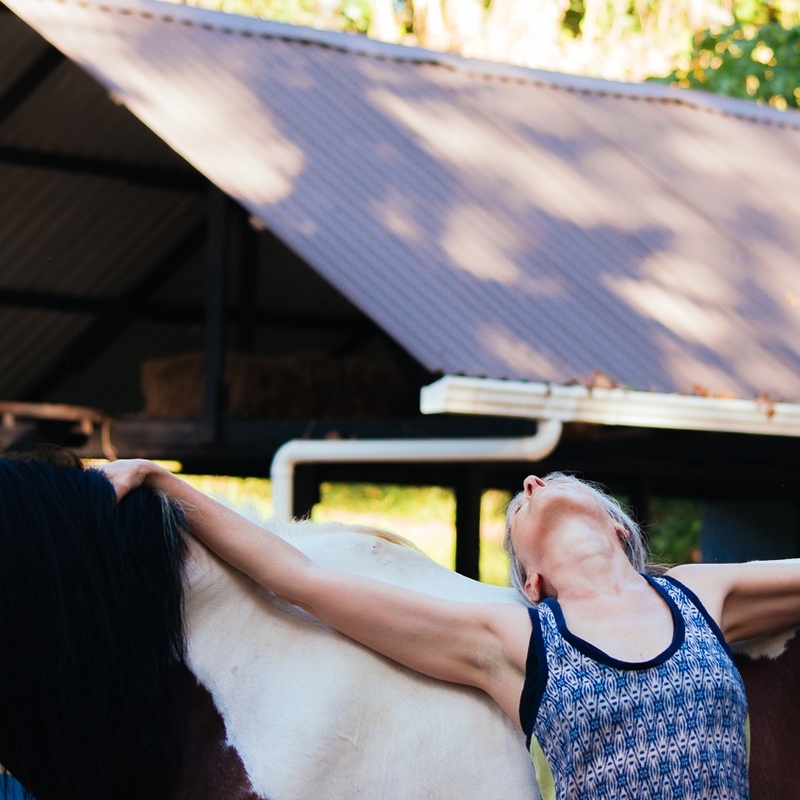 Kindred spirits have achieved this beautiful combination in this equine yoga course. 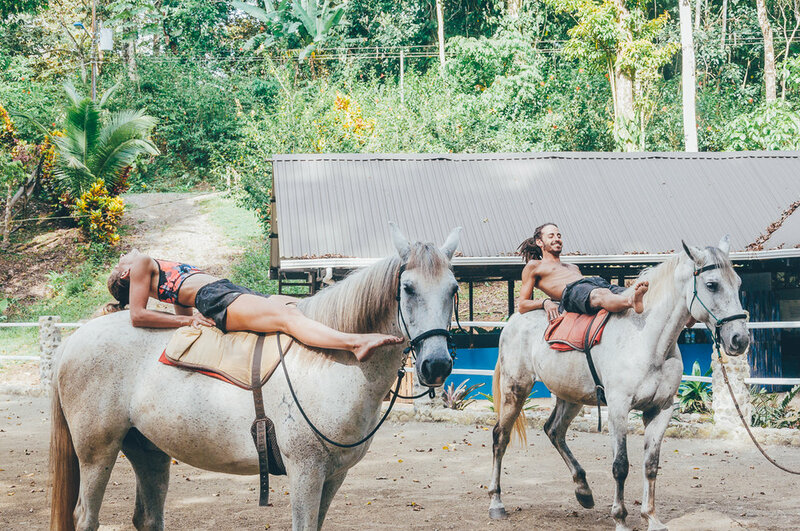 Terry guided us through connections with the beautiful horses in the amazing setting of the Caribbean coast. We learnt about equine anatomy, both physiologically and energetically and spiritually. You will learn so much more about yourself, horses and yoga. I would thoroughly recommend this to anyone who had ever felt a connection with nature or beautiful horses... I am beyond grateful for the beautiful food, the personal insights and the space held by the horses and the people at kindred spirits which will forever be in my heart.